To see a full demonstration click here! 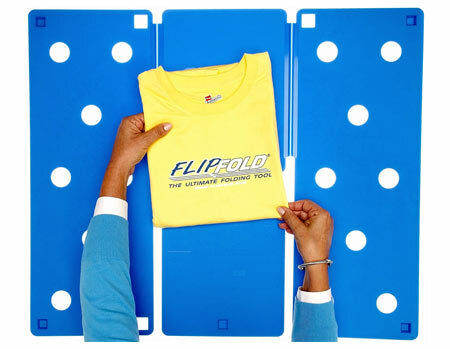 The FlipFold makes it easy to perfectly fold shirts to show off your graphics! The steps are in the name…just flip, flip, flip and fold. It’s that simple! Folding laundry will take less time, and you’ll get perfectly folded laundry…every time! Use FlipFOLD on almost anything. It works on any shirt including long sleeve shirt, short sleeve shirt, tank tops, button down shirt and collared shirt. Use FlipFOLD for folding your pants, shorts, skirts…even towels and sheets! And it’s so easy to use, as seen on tv, you can teach your three year old to use FlipFOLD! This folding tool has even been husband tested! We love time saving tools and this is definitely one of them!